Kindly email me within 24 hours your complete name and contact number (ntiu1027@gmail.com). Can't wait to talk to you and meet you guys in person! Well, the good folks from Philosophy Philippines enjoyed the first get-together and they wanted more! *yay*! So here goes my second invite! And here's probably what's on your mind, how to join? Comment ONCE with your name and email address. Contest starts today ends June 21, 2015. 10 winners will be picked via Random generator. 10 winners will be announced in this Blog post and my Social Media Accounts (Follow me @AskMeWhats on IG, Twitter and FB). Winners must email me back within 24 hours or I will pick a new winner. PLEASE: I have to stress this again that the workshop can only handle maximum of 10 participants and I don't want to waste the slot to a No Show :) I hope you understand! Answer these 2 queries: "What's your favorite Philosophy Skincare product and why? ", "Why should you be chosen to be part of this exclusive Philosophy Workshop?" 10 winners will get to bond with Me and Philosophy (free facial, a lot of skincare talk and you may ask me questions!) 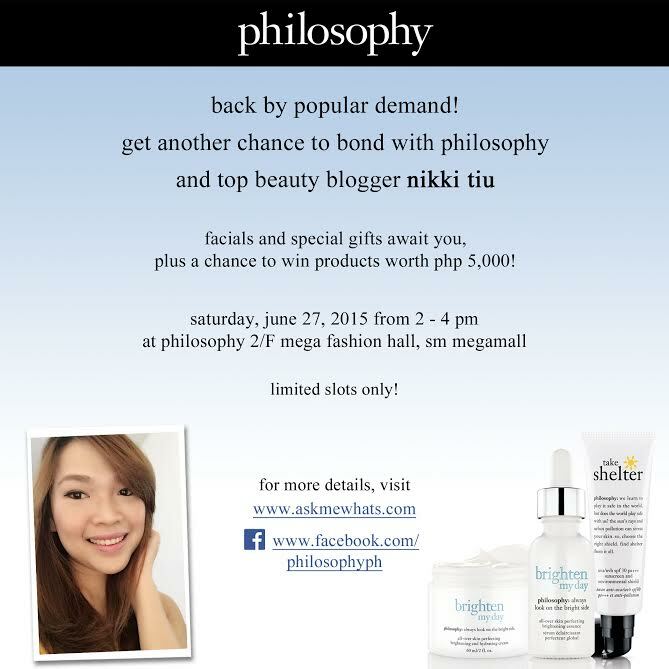 Aside from that, all 10 attendees will get to take home Philosophy Fab5 Kit worth Php1,495.00 each and more surprises! What are you waiting for? I can't wait to read your comments and I can't wait to meet all of you!!! Awww.. dahil masunurin ako.di na ako join, hehe.. so others may experience the "magic" of philosophy. Will share na lang this to my friends.. ;) kung may fans club ka Ms. Nikki baka isa na ako sa officers haha..
1. I love hope in a jar-night. I've been using it for a month now and my skin feels softer than ever. Because of this product I am able to maintain my youthful glow even though I am working at night. I get compliments for my skin on how radiant it is even on makeup-free days. I love the purity cleanser. Tried it once and got hook right away. At 36, I don't have any skin regimen I stick too. I guess it's time to learn a trick or two. This would be very helpful since I travel a lot. I honestly havent tried the Philosophy Skincare products but I really really love to try it, I read some reviews about it and those really gave me interest to bought the product since it is specialized in skin care which I need the most nowadays, also I really really to the highest power really want to have some fragrance from them, ^^ If you will ask me what product I am very interested to have it is the overnight repair salicylic acid acne treatment pads.. I love the purity cleanser, tried it once and got me hooked right away. At 36, I don't have any skin regimen I stick too. I guess it's time to learn a trick or two. This would be helpful since I travel a lot. 1. I love how Philosophy Hope in a bottle provides my skin great hydration without the heavy feeling and helps me clean out my acne. My skin is now smoother, supple and less break outs than before. 2. I'd like that big virtual hug into big actual hug and see you in person. Would love to learn a lot from this skincare talk. I might discover new products from Philosophy and I might find some of their products as a new favorite. I love to join this once in a life time philosophy workshop, Because I know this is new to me and I always heard a good reviews about their products. Though I'am always present at your workshop but this one is quite different. It's all about skin on how to improve more. I haven't tried anything yet with the brand Philosophy, but i have read way many good reviews re Hope in a Jar moisturizer. I wanted to try it if not for the steep price. I have a dry skin, and i'm on the lookout for a skin care product that will help me battle out my concern. I hope i'll get a slot, for me to know more about the brand and to try their products. Philosophy Amazing Grace Body Butter makes skin feel supple without the greasy after-feel. *I remember buying When Hope is not Enough Facial Firming Serum as a gift for my mom and she told me how she loves it! Knowing my mom as a very very meticoulous woman when it comes to skincare products, I find it odd for her to actually praise a certain skincare product. I got curious and I would then sneak in her room to try it for myself (lol). I ended up loving it! I've been taught that we should start with our anti-aging skincare early, and this serum has been really helpful for me. I was feeling guilty I've been using mom's so I then decided to get one myself. I use this every night and everytime I'll undergo microneedling and revlite. It helps a lot making my skin plump and soft! My experience: I always love to make up the beauty products that i can afford everything but i dont use the skincare since born to 2013. Some of service women said me important skincare for it's protection. When i remind it in 2014 because it is safe on my skin and be clean & age. But not a much skincare because i cannot afford it, expensive anywhere also dont have job that im Deaf person is difficult life of budgets and expenses why reasons i got care on my skin to be beautiful own my ways. I wish this and join the workshop. Send to know my email? 1. Purity made simple. It has a clean & pleasant odor. I use this morning & night. It's quite gentle & effective at removing even the most stubborn makeup and my face feels clean for hours. 2. I really want to meet you Ms. Nikki. I look forward to the workshop as this will be a great opportunity to learn about makeup and skincare from the expert. To be honest I haven't tried any Philosophy products yet. But I've been always wanting to try their Micro delivery peel. It's on my priority list of products to be bought now. I've searched for a lot of review and got great feedback about it. It is the change that I've been wanting to happen to my skin since it is really dull and needs to be revived. Why me? It is my birthday month. It will be on 23rd of June and if ever I'll be chosen that even could be a post birthday gift to me. Since I'm adding a year to my life Its better for me to add more knowledge on how will I take care of my skin as I age. New age and new skin change journey I must say. Having dark circles under my eyes give me a feeling of low self confidence. They make me look like a panda (although I love Pandas coz their cute). I mostly depend on Philosophy's "Miracle Worker" Concealer because it's good in concealing my flaws. Eversince I was introduced to it, it instantly became my bestfriend. I salute Philosophy with their promise to deliver remarkable products that inspire people to live better lives by being better to themselves. And it would be an honor (aside from the bragging rights) for me to participate. If ever, this would be my first time to be part of this kind of workshop-bonding event. For sure, I'll be bringing home with me lots of learnings, tips and a wonderful experience that will inspire me to look, feel and live my best. Hi Miss Nikki. I really want to be part of your last workshop but didn't got the chance. Anyway, for the first question, I haven't tried any Philosophy product yet since I'm from the province and I don't know where to get it here but I've been eyeing to try the When Hope is not Enough Facial Firming Serum with it's nice reviews and Hope in a jar too. 1. The only product I have tried from Philosophy is their 3-in-1 bath products and I LOVE them! I usually buy a bottle whenever I travel and because I buy different scents each time, they've become associated to the places I go to. 1. Shampoo, Shower Gel, and Bubble Bath 3-in-1s. My daughter would always share hers with me. Our favorite is the Vanilla Birthday Cake. Fave philosophy product? The microdelivery! This really gives you that diamond peel effect! It makes my skin soft and smooth, plus i think it shrinks my pores. Why i wanna join? I'd really wanna meet and bond with you! Plus i wanna hear your thoughts on skin care! 1. My fave products: Purity made simple facial cleanser and hope in a jar original formula moisturizer. This combination has been my ultimate skin care regimen. It leaves my skin clean and fresh without drying. I love that they come in travel sizes - so convenient when I'm traveling. 1. Hands down, its PURITY made simple cleanser. The only cleanser mild enough and doesnt strip off your skin but tough enough to remove dirt from your face. 2. I recently attended one of your workshop and It was one of the most fun and enjoyable workshop ive attended.Got to learn new ideas on skincare. I love makeup but recently ive been into skincare more because my adult acne suddenly decides to kick in. Philosophy is one of the product or brand i want to explore more. So fingers crossed..hope I get picked! Truth is I've never tried any product of this brand but whenever I stop by at Megamall or in Glorietta, I always make sure to pass by to see if they have promos because they're so expensive (T...T). Sana nga po may sample po sila na pwedeng ibigay even if we haven't purchased anything. I heard and read a lot of good reviews about this brand and the beauty bloggers even the "food bloggers" are actually using and recommending it! Wow! That is why...I really want to be included in your workshop this time. I actually went to your first batch of Philosophy workshop too on my way home and saw you and the lovely ladies po. I really hope I can finally attend your exclusive workshop po. My favorite Philosophy product is Hope in a Jar. I never used moisturizers before because of my oily and sensitive skin. But when I used a trial sachet of this, I didn't break out and it made my face smooth and in an appearance that I love. Please pick me for your workshop because I want to try other Philosophy products. It looks like their products really agree with my sensitive skin as I also use Purity, which I love. More power to Philosophy! I never had the chance to try any of the products yet and currently in a quest to experience the best skin care line that suits my skin type, I was recently hooked to products from Benefit Skin Care Line and Kiehl's and when I saw the Philosophy store at Megamall, I immediately found myself looking at reviews of the products. Being particular about keeping our skin healthy and taken cared of could just be one of the many things we could agree on. To be part of the wrokshop will be a mutual avenue of learning experience. My favorite Philosophy product is from the Brighten My Day line - the all-over skin perfecting brightening essence. I never had any consistent regimen in the past but this helps tone my skin and eliminate dark spots without the sting. I like using it regularly and have seen improvements since the first time I used it. Got your email Ms. Nikki. Thank you :) and see you!